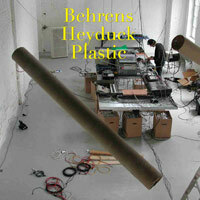 "Plastic Metal" is a collaboration project by German sound artists Marc Behrens and Nikolaus Heyduck. Years after they first met, Behrens and Heyduck realized that each of them independently had been working on the same kind of material, such as plastic bags, bubblewrap, chocolate, medicine, and toy packages. Heyduck had made several sound and video installations, Behrens had composed "Scenes for Contraction" in 1999 (released on his solo CD "Contraction"). 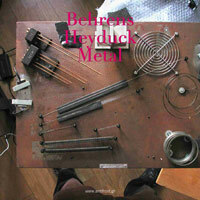 The Metal piece was initiated when Heyduck helped to clean Behrens' cellar one day in 2001. He found two steel drumsets that Behrens had built in 1991 and left to oxidate in a remote angle. The artists decided to reactivate these instruments for another collaborative project. An extensive recording session and successive digital processing resulted in the basic material used for two performances in 2002 and 2004. Both pieces of this release are products of an evolutionary process - an interaction of sound recordings and physical objects exposed to a live concert situation, and further elaboration to create a concise composition in CD format. Nikolaus Heyduck is an artist working with audiovisual media since 1978. He studied art in the 1980s and composition in the early 1990s. Marc Behrens is perhaps best classed as a "sound artist", working internationally across performance, installation, and recorded media (audio and video).